What Are The Benefits of iPhone X Wallet Case? 1. Open the iPhone X wallet case and look at the various sections. You will observe that certain sections hold certain items, while other ones are strategically designed to hold miscellaneous items. You can easily store all of your personal items. 2. You can find the credit card holders located within the iPhone X Wallet Case. You can conveniently store credit cards as well as business cards inside the case. 3. You can get everything into the iPhone X Wallet Case for safe and effective storage. 4. You can place your iPhone X in a safe and secure manner and with a closure flap over your mobile to protect it from dust and scratches. 5. You can place your accessories such as a Bluetooth headset, earphones, etc. into the case. 6. A wallet case like this one gives you the ability to store many different items, and ensure that all of your items are kept safely. 7. The Caseme iPhone X Wallet Case offers a more professional look and has many trendy features. 8. You will not have to worry about the space for storing your cash, ID card and driving license. 9. 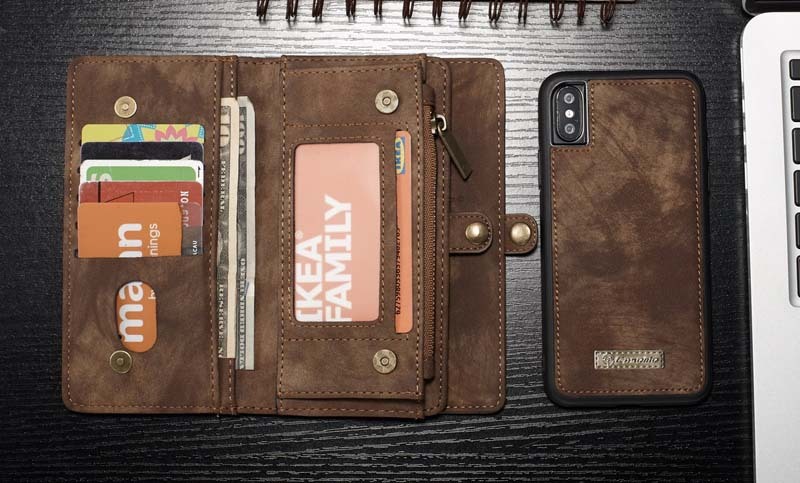 The inside of this iPhone X wallet case zips, so you do not have to be bothered about losing any of your items. 10. This is a great wallet case place to store your business-related items that you may need in your meetings. 11. This iPhone X wallet case has been specially designed in Britain, and offers maximum protection to your gadget. 12, The smart rubber padding absorbs impacts and softens fall, and a tough internal shell of the bumper cover holds your iPhone X firmly.